It feels a little surreal being back here, writing a post for a recipe. The time away was needed, though. I hadn’t realized it, but Well and Full was representing (to me) a part of my life that I now want to put behind me. There were good times, a fair share of bad times, and people who I wanted to let go of. And I needed some time to refresh, renew, and re-affirm what this blog means to me. In terms of my personal life, I’ve done quite a lot of changing in the past few months. I’ve been single for nine months now, spending time recognizing the parts of me that have been constant, and the parts of my life that require a new start. Some of the relationships I’ve cultivated have changed – some have faded away, and some have deepened. I’m excited to see where the latter goes. Regarding Well and Full, I realized that I wanted to revitalize the type of content I’m posting here. It’s time to get back to the basics. I’ve never been the type of eater to opt for the exotic over the familiar, so why should my cooking be any different? As much as I like trying new cuisines, my style of food has always been seasonal and simple. 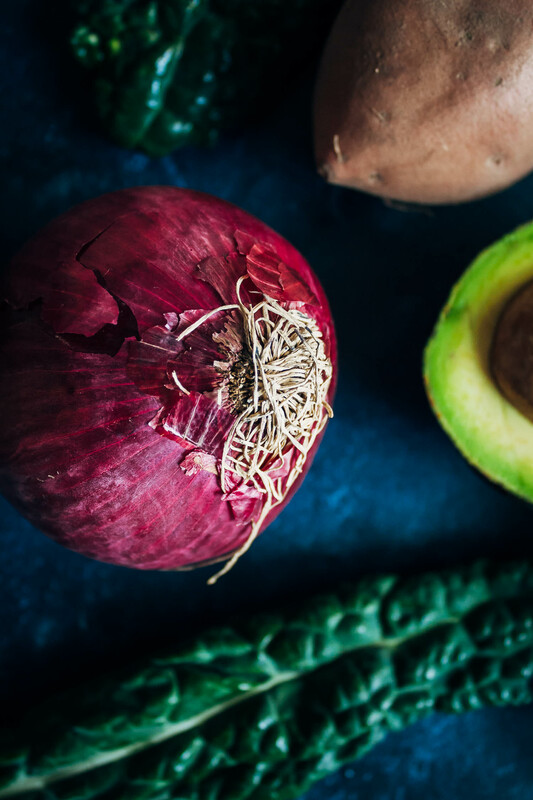 I want my recipes to be accessible and hassle-free for my readers, so there will be fewer mentions of specialty ingredients around here (although they might pop up once in a while for fun!). Above all, I have to be true to myself – cooking the type of food I like to cook, because it will show in the recipes. If my food isn’t genuine, it won’t taste as good. Simple as that. Today’s recipe is a nod to early autumn, with hearty sweet potatoes roasted in the oven. 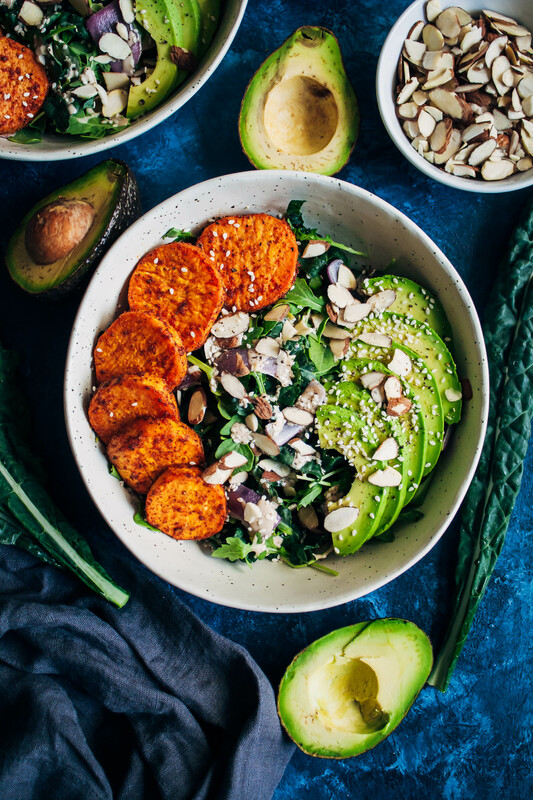 Hardy dino kale, still available at the farmer’s markets, provides the base of this chipotle sweet potato bowl, rounded out with sliced avocado and topped with nuts and seeds. 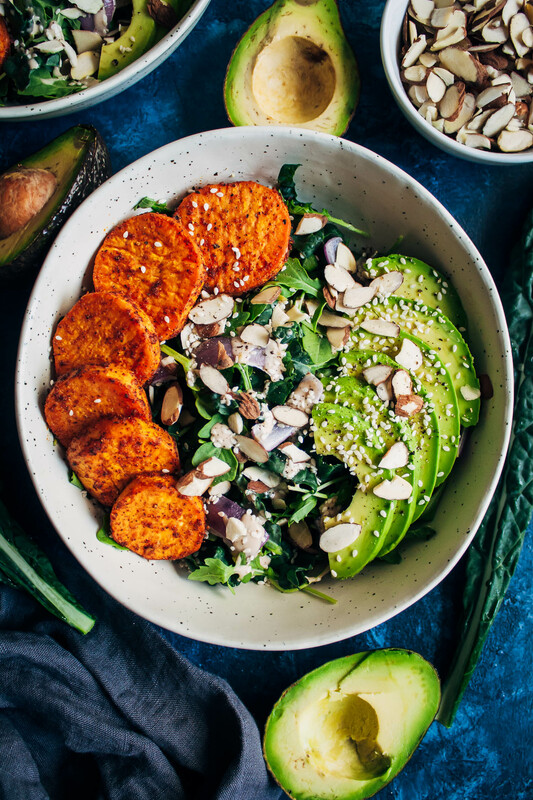 This chipotle sweet potato bowl is the perfect meal for late summer / early fall - farmer's market kale and roasted sweet potatoes take center stage, topped with a smoky tahini peppercorn dressing. Prep the sweet potatoes and red onions - peel and slice. Toss in bowl with the olive oil and spices, until evenly coated. On a baking sheet lined with parchment paper, bake in the oven for 20 minutes, checking halfway. In a bowl or mug, combine all dressing ingredients until evenly mixed. Taste, and adjust seasonings to your preference (i.e. add more lime juice). 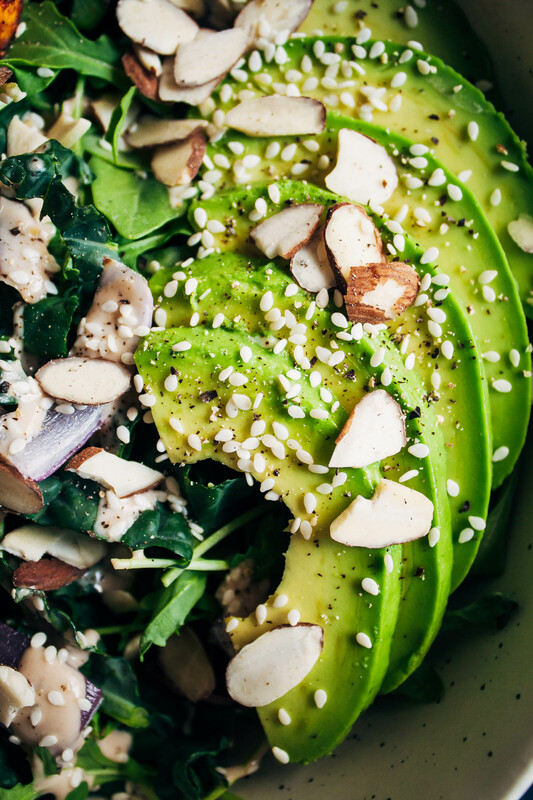 In two bowls, put down a layer of the dino kale and arugula (optional). Layer on the sweet potatoes, onions, nuts, and seeds. Top everything with the tahini peppercorn dressing. For the tahini peppercorn dressing, the amount of water you will need to thin will vary based on the brand you use. Start with 1 Tbs water and stir in - then add more water based on how drizzle-able you like your tahini! Hello Sarah, it’s so great to see you here again! I :) was worried that you decided to abandon the blog for good. I love your attitude to food and the notion that it is an extremely important part of our lives. I also do believe that we express ourselves through the way we cook and eat our food. I was – and have been ever since – drawn to your blog because of a certain honesty and authenticty of your food creations. So keep on blogging and sharing it! Thank you so much for your sweet note, Katya :) It really means so much to me. I’ve always tried to be authentic with my readers, and I hope it shows!! So great to see you back in this beautiful space you’ve created, Sarah! And good for you for offering yourself the time to pause and reflect. It’s admirable. Hey Alanna! I totally hear you – I feel like I set up so many “rules” in my head when it comes to this blog and I have to remind myself that they’re self-imposed. And, like you said, nothing is set in stone. Hugs! Sarah! You’re back!! I was happy to see a message from you in my inbox. :) I love all the different colors, tastes and textures in the bowl you created. Seasonal and simple food sounds great to me. Sending you positive vibes and a virtual hug as we head toward autumn. Great to have you back, Sarah! I miss seeing your beautiful photography and creations. And good for you for taking a breather and working on YOU. Self care has never been something I’ve excelled at….but I’m trying! XOXO! Thank you Ruby!! There are still things I’m struggling with (concerning this space) but hopefully they’ll be resolved soon. Hugs! These bowls are beautiful and look like the perfect easy fall meal! Glad you had the chance to step back and reflect on what this blog means to you. I’m sure every blogger can relate, I know I sure can! I wanted to note a couple things. First, I dig your food photography! I love the color scheme and blue background you used for this post! Second, my friend is visiting town and wants to cook together. She’s vegan, so this dish is the PERFECT recipe for us to make! Can’t wait to try it! Thanks so much for your note and your kind words, Christina :) I hope you and your friend like the recipe!! Can’t wait to try this Sarah! Fall is my favorite season (I’m an October baby) and I’m always looking for great seasonal dishes to try. It’s tough finding cold weather dishes that aren’t laden with cream and butter or other heavy ingredients. I love finding more nutritious alternatives! I’m a fall baby too!! :D It’s my favorite season and I love posting fall recipes. I hope you like this recipe!! That looks absolutely beautiful! What a fun meal. I love this dish and I love all of your recipes!!! I’m trying to cut back on meat, so I’m starting with vegan dinners and going from there and your recipes make it easy! I feel so full and it’s so tasty and better… it’s so simple. You’ve made this transition so easy and I’m not missing meat! !